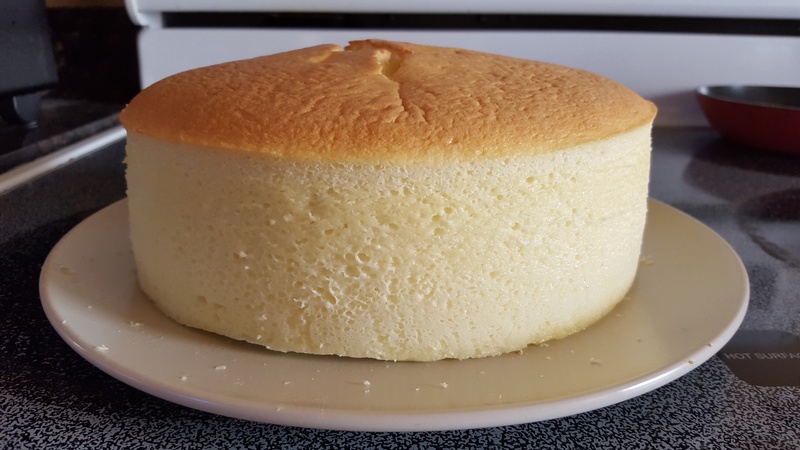 Japanese Cheesecake Recipe: Almost everything you need to know! Back in 2010, I spent a few months perfecting my Pandan Chiffon Cake. I haven’t been baking since. You see, I am not a baker at heart. What I do love is exploring kitchen science and a good challenge. So when it comes to baking, I have to learn everything from scratch. I make plenty of mistakes along the way, but each time I fail, I learn something new and that keeps me going. 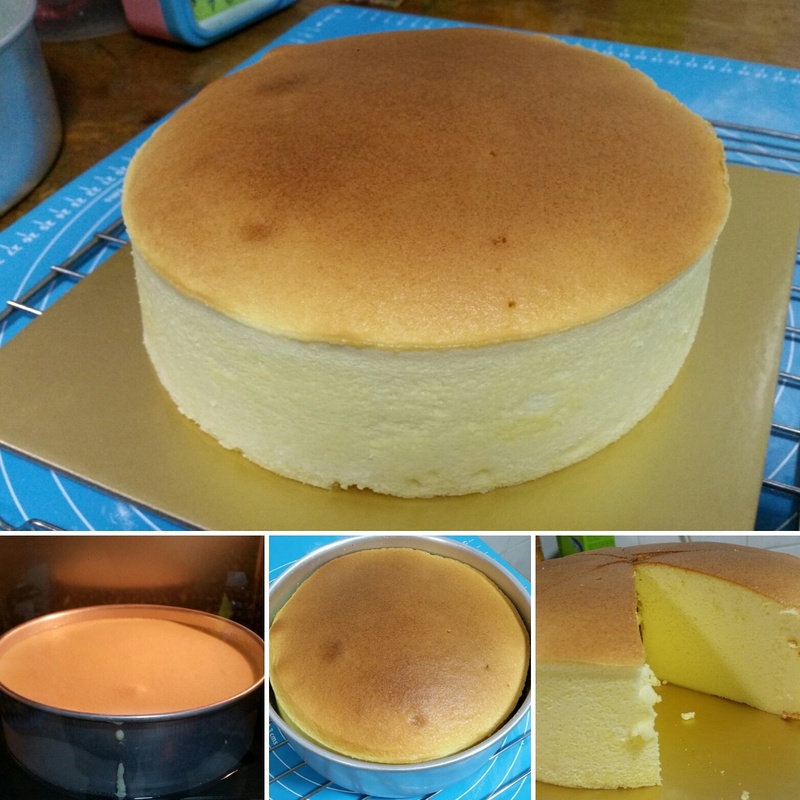 Now, it is easy to bake a cheese cake that looks bad but still tastes good. All of my failed attempts tasted good (see photos above). The most challenging thing about this cake is to be able to bake it such that there is a nice dome on top that is smooth and not cracked. All the attention to the nitty gritty details in the recipe is to help you achieve a perfect domed top and a beautifully moist and melt in your mouth cheesecake which will make all your friends green with envy and begging you for the secret recipe rather than patting you on the back and consoling you that the cake still tastes good despite the way it looks. Perfectly baked cheesecake. Still moist on the inside. 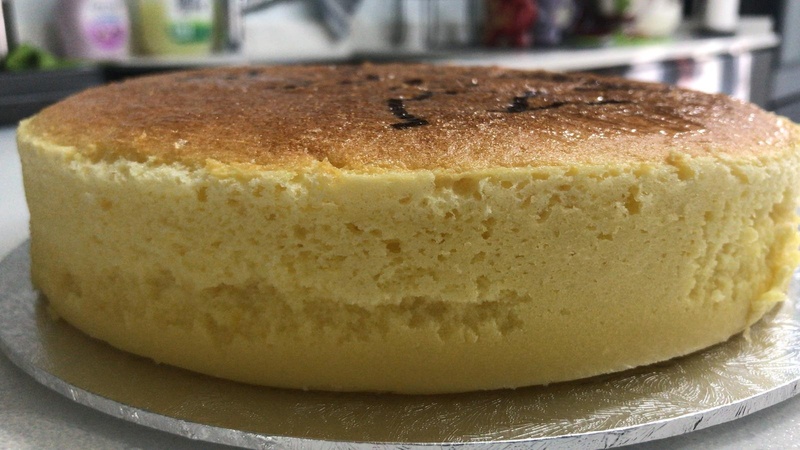 The ingredients in the recipe for the Japanese Cheesecake is quite standard and can be attributed to Diana’s Desserts whose recipe has been replicated by bakers in the online community. My recipe is based on her ingredients while the procedure is based on Chef Yamashita’s book with some modifications. 14. Bake in a waterbath on the bottommost rack in a preheated 200 degree C oven (top and bottom heat, no fan force) for 18min, lower to 160 degree C for 12 mins and turn off the oven and leave cake in the closed oven for 30mins. Open the door of the oven slightly at the end of the baking for 10mins for cake to cool. The video below outlines all the steps in the procedure. If you have followed the procedure and have ended up with the perfect cheesecake the first time then CONGRATS! Well done! However, if you find that your cake isn’t as good as it should be then read on! Since this is a cheesecake, the cream cheese that you use is important not only for the flavour but also for the texture. I have used many different brands of cream cheese and my family and friends can tell when I use a different brand of cheese. Philadelphia cream cheese works perfectly for this recipe and will result in a cake that is light and fluffy with a subtle but distinct flavour which is well liked by my guinea pigs tasters. I once tried a different brand of cream cheese which resulted in my cake splitting every time I bake. It took me a while before I figured it out, but I eventually read that cream cheeses have binders in their formulation. So I postulated that some cream cheeses may have too much binders which will result in a stiffer texture which breaks easily when the cake starts to rise. So make sure you buy a cream cheese which is creamy and soft even when it is cold and not stiff like a sausage (like the one I bought)! Eggs come in all sorts of sizes. This recipe is based on 60g eggs. Look for cartons which state that the 10 eggs have a net weight of 600g. Eggs usually have a shelf life of about 1 month. Look for the expiry date and choose the freshest ones. Fresh egg whites will whip up better and taller. I find that it is okay to just use eggs straight out of the fridge. Make sure that when you separate the eggs that you don’t get any yolks in the whites or the whites will not whip up well! This cake will tend to break if the structure is too strong. That is why you need to use low gluten flour. The gluten is still needed for the cake to rise as they form a stretchable membrane around each air bubble which allow them to expand like little balloons. The starch from the wheat flour as well as the cornstarch helps to delay the coagulation of the egg proteins. Once the egg protein and gluten stiffens, that is when the cake rises rapidly. From my observations, this happens at around 85°C. That is why I timed my oven temperature such that the cake plateaus at an internal temperature of 80°C. If you cannot find cake flour, then you can approximate it by the formula: 1 cup plain flour – 2 Tbsp plain flour + 2 Tbsp cornflour = 1 cup cake flour. But bear in mind that cake flour is bleached, ground more finely and formulated to be able to hold more sugar, so it is still better to use cake flour if you can buy it. Hong Kong Flour, Top Flour and Super Lite Flour should work as well, but NOT Self Rising Flour. Self rising flour has got baking powder in it and will turn your cake into huat kuay! You need to use castor sugar, not fine sugar. The sugar crystals in castor sugar is finer than fine grain sugar and is essential for making a good meringue (whipped egg whites). If you don’t have castor sugar at hand, just use your grinder to grind fine sugar into a powder. Don’t use icing sugar as it contains additional cornflour and might mess up your cake! Salt improves the flavour of anything sweet which is why salted caramel is so nice. It has been shown that salt activates the receptors on the tongue and increases the perception of flavours, so don’t omit it! Choice of cake pan is important! Save yourself some heartache and go buy an 8 in wide, 3 in high non-stick light coloured cake pan for your cheesecake. I bought mine at Bake King near Haig Road market. You will notice that I don’t use a springform pan or line the sides with baking paper. I also hate having to line the springform pan with aluminum foil which can still sometimes leak and allow water to seep into the cake. (Yes, it happened to me before). I found that lining the sides with baking paper results in creases around the sides of the cake which is quite ugly. Using a one piece non-stick cake pan is much easier and results in a cake with very nice, straight sides. You need to use a light coloured pan because those black pans will absorb heat easily and cause the sides of your cake to bake faster than the middle. This will cause it to dome and crack. I found that the non-stick, light coloured pan is the way to go. With this pan, the batter will come up to about 1.5 cm from the rim which is just nice as the cake will rise about 2 cm using the oven timing I provided. If you try to bake this at 160°C for 1 hr 10 mins as per most internet recipes, the cake will rise very high and then deflate resulting in an ugly wrinkled top. Spray the sides of the pan liberally with non-stick spray. If you don’t have non-stick spray at hand, just brush the pan with butter and dust evenly with cornflour. Make sure that you apply the non stick spray thoroughly so that there are no dry spots, especially at the rim of the cake pan. The batter will stick to any spot which is dry and that will stop it from rising. Once that happens the cake will start to dome and the chances of a crack increases. The top should rise up evenly like a souffle. 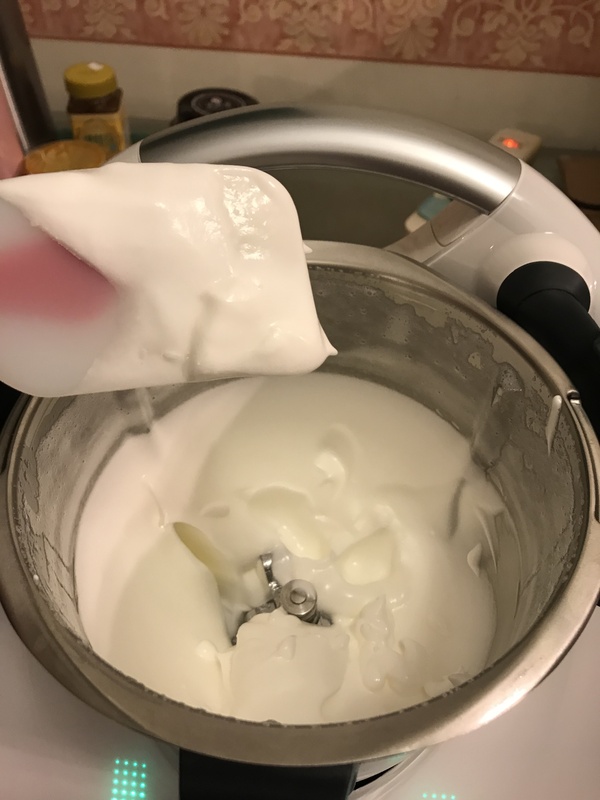 I found it difficult to get a smooth mixture when I melt the cream cheese together with the milk as most recipes tell you to do. Much easier to place the cream cheese over a warm water bath, cut it into cubes with a pair of scissors, allow it to warm up and whisk. You will find that the cream cheese will melt nicely into a creamy smooth mixture to which you can then add the egg yolks. Make sure you sift the flour to remove any lumps and fold gently just before you add the whites. Don’t be too bothered if it looks a little lumpy, as long as it is relatively smooth, you will be fine. Don’t over mix it as more gluten will form when you mix. More gluten will make the batter stiffer which result in more bubbles, more rise and a broken cake. Fold and mix gently and don’t allow the batter to stand for too long with the flour in the mixture as gluten starts forming when it is wet! The temperature of the batter should be between 40°C to 50°C. It should not be cold, neither should it be too warm as the cake will cook too quickly when it enters the oven. When this happens, the cake will break because the sides cook too quickly before the middle. 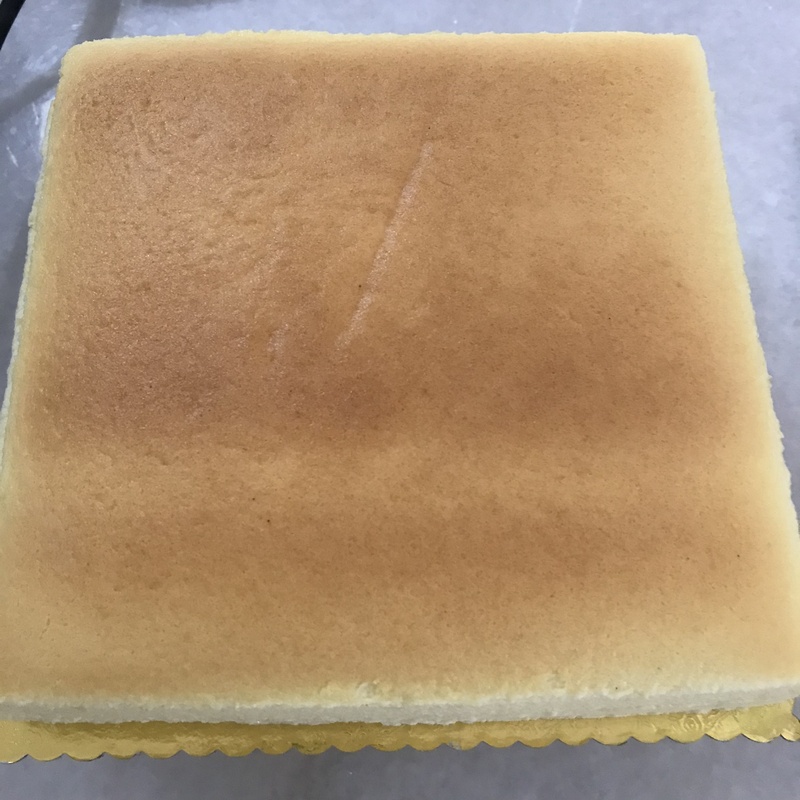 The Japanese cheesecake is not like a chiffon cake where you want the cake to rise a lot and create lots of bubbles in the structure of the cake. It is light but still creamy and the bubbles remain very tiny. Don’t over whip the whites! If you get to stiff peaks, then your cake will break! I don’t even beat to soft peaks as I want a batter that is easily pourable. Somewhere just past the ribbon stage (the whites will form ribbons as it falls from the whisk) and before soft peaks where you get about 3 inches of whites left on your whisk after you lift the whisk out of the bowl for 2 seconds is just right. I don’t use my counter top mixer as it is too efficient and I often over whip the whites. A handheld beater gives you more control. Don’t forget the cream of tartar. It helps to stabilize the whites even through the baking stage. You are aiming for a meringue which is smooth and silky with a bit of sheen (from the sugar) that is easy to fold into the batter. It should not be lumpy at all. Err on under-whipping rather than over-whipping it as this cake doesn’t need so much air in it. Once the whites are mixed into the batter, you should have a batter with the consistency of thick potato soup and very easy to pour. You should not have to level the top with a spatula. It should just flatten out by itself. The batter should come up to 1.5 to 2 cm from the rim of the pan. You need at least 1.5cm for the cake to rise, so if for some reason you have extra batter (like you used 65g eggs because you never follow instructions! ), don’t try to save it by overfilling the pan, just throw it away or you will end up with an ugly cake. Make sure you tap the cake pan on the table top sharply to release as many bubbles as possible! Bubbles will rise to the top during the baking and produce cracks! You need to bake this cake in a water bath as the water will absorb the heat and provide a gentle, moist heat to bake the cake. Try to get another pan which is 1/3 larger than your cake pan. No one actually mentions this, but the amount of water you have in the oven actually matters! I found that when I used a big tray of water, it took a longer time for the internal temperature of the oven to rise to the set temperature. This makes sense since the more water you have, the more heat it will absorb! So use a pan which gives you about 5 cm of water all round the cake pan. I also found that it is useful to place a folded towel at the bottom of the pan in order to make sure you have a layer of water beneath the cake pan. You will be baking this cake at the lowest rack, so it is near to the bottom heating element. Placing a towel there will ensure that the temperature at the bottom of the pan never rises above 100°C. You should fill the pan with hot water. It doesn’t have to be direct from the kettle but it shouldn’t be cold. I usually use the water from the double boiler. The water should be about 1 inch high which means that it is 1/3 the height of the cake pan. It is important to have it high enough as it helps to keep the sides of the cake pan at a temperature that is close to 100°C. This prevents the sides of the cake from cooking too quickly which means that it will set before the middle of the cake. When that happens the cake will “dome” and if it domes too much it will crack. Most online recipes say that you need to bake the cake at 160°C for 1 hour 10 mins. For my first few cakes, I found that my cake often rises too much and then cracks or deflates resulting in an ugly wrinkly top. I got so frustrated that I decided to put a temperature probe in the cake as well as the oven in order to know what exactly is happening in the oven. 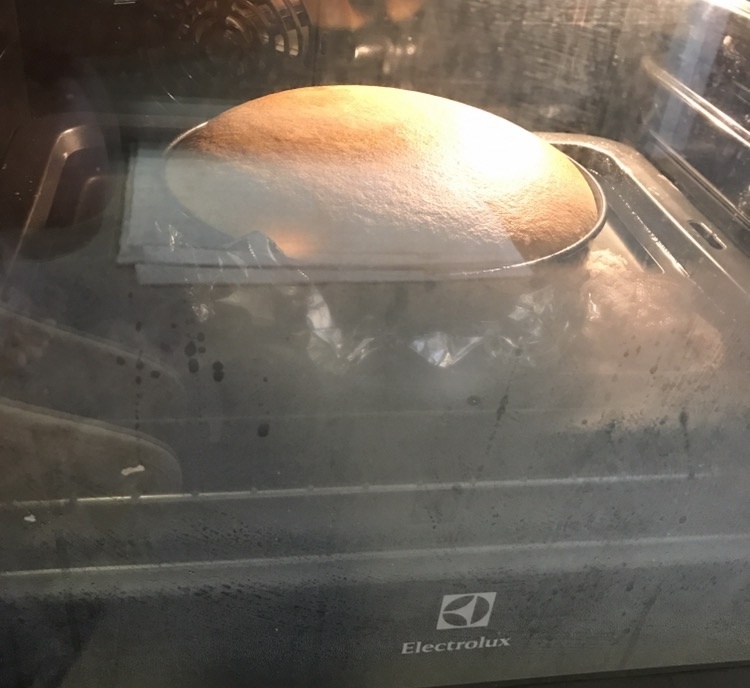 What I found was that at 160°C, the temperature of the cake would have risen to 75°C by the 40min mark, by around 50 mins it would be 85°C and the cake will rise exponentially, resulting in a very tall cake which might crack or even if it didn’t, will have a wrinkly top after it cools down. (Just like stretch marks after giving birth). I decided that I should bake this cake such that it rises as little as possible. Normal whole egg will coagulate at 68°C. With all the other ingredients added, the coagulation temperature is around 80°C. So what we need to do is to come up with a temperature and timing which will bake the cake to an internal temperature of 80°C to 85°C. That would be when the egg proteins just start to coagulate. Stopping the cooking at this temperature should result in a cake which is more tender and moist. It is just like cooking a hard boil egg to 80°C as opposed to 100°C. Overcooked whites turn rubbery. I expect it’s the same when it is in a cake. If we bake at 160°C, by 40 mins it will have an internal temperature of 75°C and when we turn off the oven, it will continue to rise and plateau at 81°C. But the problem is that the top will look pretty anaemic instead of having that bronzed South American suntan look. That is why I decided to pre-heat the oven to 200°C instead. Once the cake pan and waterbath is placed in the oven the temperature falls to 180°C and remains there for the first 18 mins. By this time the top will be slightly tanned. We then lower the temp to 160°C before the oven temp starts to climb again. By the 30min mark (from the start of baking), the cake would have risen by 1 – 1.5cm and have a nice brown domed top. The internal temperature of the cake at this stage is 75°C. That is when you turn off the oven and allow the residual heat to continue cooking the cake. The internal temperature of the cake should plateau at 81°C and the cake rise by not more than 2 cm before it starts deflating in the oven. By the one hour mark the internal temperature of the oven would have fallen to 110°C. This is when you open the oven door by 10cm (just slightly ajar, you don’t have to measure this!) for 10 mins. The cake would have already shrunken and pulled off the sides and ready to be de-panned. Every oven is different, so you may have to adjust the timing to suit your own oven. Having an oven thermometer will help. As long as you keep the oven temperature at around 180°C for the first 18 mins and then lower it to 160°C by the end of the 30min mark, your cake should be cooked nicely. NB: I bake with top and bottom heat, no fan force mode with the cake placed on the lowest rack. It works for my oven. You can try this first and adjust according to your own oven’s performance. An oven thermometer is a very useful instrument to have. This step is entirely optional, but I think it adds a nice personal touch if you are planning to give the cake as a present. All you need to do is to set aside some extra cake batter and mix it with cocoa powder. I use powder because it helps to thicken the batter so that it is easier to pipe. The dots are easier to do by using a satay stick dipped into the batter. Make sure you sift the cocoa powder to remove any lumps and mix well! Since the shooting of the video, I have found a better way of drawing the cartoon. Instead of pouring out some batter and setting a side, just pour out the batter into your cake pan. Then instead of scraping the bottom of the mixing bowl, just shift some chocolate powder to whatever is left in the mixing bowl! This accomplishes 2 things. 1. If you did not mix the batter well enough, all the heavier batter will be at the bottom and if you scrape it and add it to the cake pan, it will sink to the bottom, resulting in a dense layer. 2. It is easier to sprinkle and mix the cocoa powder when it is already covering a wide area in the mixing bowl! Instead of a piping bag, I bought a special silicone piping device which makes it so much easier than a piping bag. I bought mine at Takashimaya but I am sure you can find it at baking supply shops. You could probably do it with an empty squeeze bottle too! The cake looks best when it is just out of the oven. It needs to be aged in the fridge for four hours (better overnight) for its flavour to mature. But by that time the top will become wrinkly (It’s just like us humans!). In order to have a cake that looks good, you need to A. Take a photo of it when it is just out of the oven so that you can show the world how great your cake looks before it turns wrinkly, or B. Glaze it before it turns wrinkly. To glaze you need apricot gel or glazing gel which you can buy from baking supply shops ie Phoon Huat, Bake King etc. Add an equal amount of water to the gel (1:1) and microwave it till it is boiling hot and stir till it becomes a smooth liquid and apply to the top of the cake while it is still warm. It is important to glaze it as soon as you take it out of the oven as the surface needs to be warm or the gel will just set too quickly. If it cools too much, heat the top with a hair-dryer to warm it up before you apply the glaze. Apply the glaze with as wide a brush as you can and do it with as few strokes as possible. (You will only get 2-3 strokes before the gel sets and further brushing will result in a rough surface) You will need at least two coats to give it a nice smooth surface. Once you have mastered the basic cheese cake, you can then explore adding flavours to it. It can be as simple as using real vanilla pods where you scrape the seeds and add it to the batter during the yellow mixing phase or adding various flavour essences. Lavendar, Earl Grey flavour essences will work well. For a really Singapore version, you can do a Mao Shan Wang Durian Cheesecake! I have done this successfully and it is a hit with durian lovers! The flavour of the durian will fill the room and cause your guests to divide into two groups like the parting of the Red Sea! One group will be right next to your cake while the other will be outside the house! Here is my recipe. To make the Durian version, simply puree 250g durian flesh with 100ml milk (This is the same 100ml milk in the original recipe, not an additional 100ml) in a blender. Then strain it and add this to the yellow team after you have mixed the yolks with the cream cheese. The rest of the steps are exactly the same. You can reduce the amt of durian if you wish. Up to 250g is quite safe as it has worked for me and results in a cake that is moist, yet light and fluffy with the perfume (stench to some) of durian to polarize your guests! There you have it! 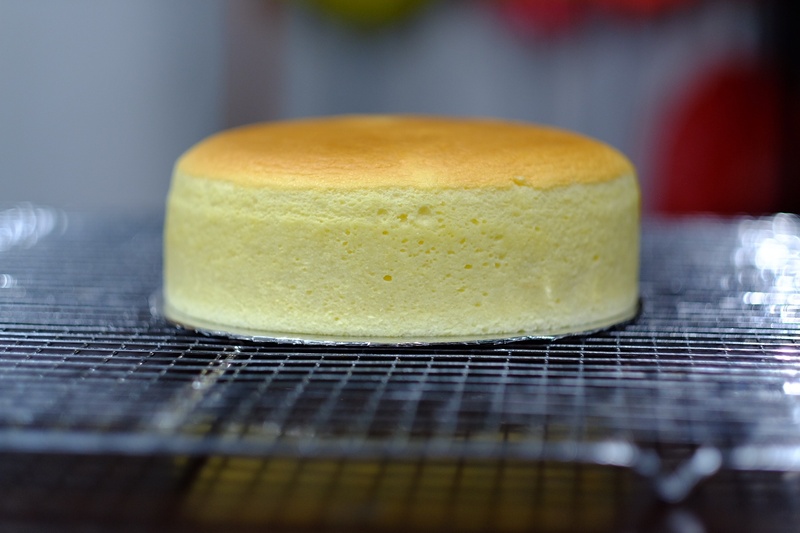 Almost everything you need to know about baking the perfect Japanese Cheesecake! May you not have to go through the same heartaches I had to go through! Do let me know of your successes! 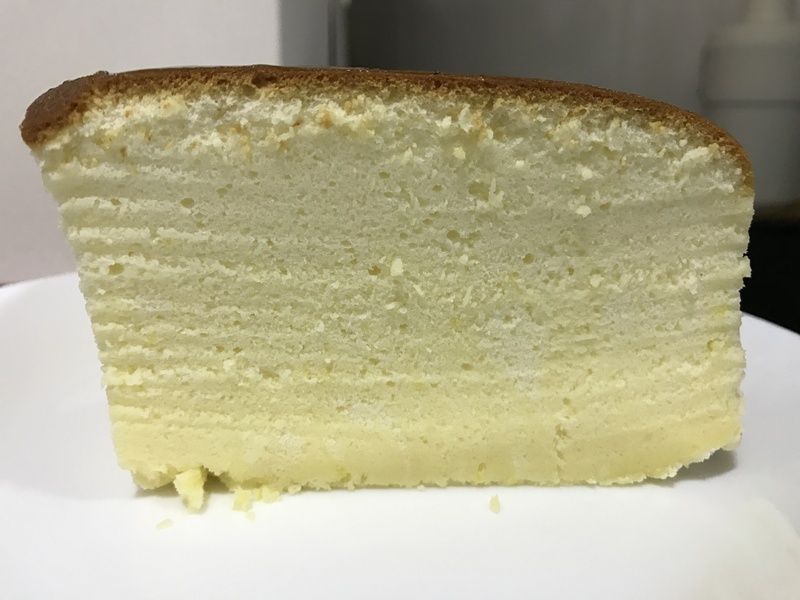 Many thanks to Chef Yamashita as well as all my numerous facebook fans for their valuable tips which have contributed to the success of this cheesecake recipe! Success? 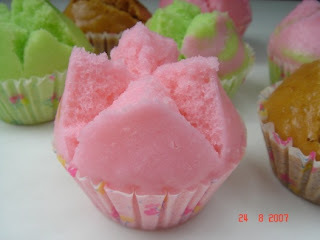 Now try my Pandan Chiffon Cake Recipe! Hi Dr, I watch your video over and over again, just wanted to check, when did you remove the water bath? Saw you putting the pan with batter into the oven with the water bath and the next thing, I saw, you remove the cake from the oven and the water bath was no longer in the oven? Oh, haha, I just remove the waterbath after the entire baking process! ie I take the whole thing out of the oven and de pan the cake. That means after you turn off the oven and leave cake in the closed oven for 30mins and then open the door of the oven slightly at the end of the baking for 10mins for cake to cool ,the water bath still in the oven? and consoling you that the cake still tastes good despite the way it looks. Amazing deciphering of the souffle cotton cheesecake! Thank u for sharing all the learnings and saving avid bakers alot of misery. Your entries are always so awesome! Thanks for sharing your recipe! Tried the recipe and it seems like my cake split into two layers, whereby the top was the light fluffy texture and the bottom later was this almost soft cheddar like consistency. The way it looks is almost like it’s a fluffy cheesecake with a springy base. Could it be that I didn’t fold the whites and cheese mixture well enuff? Followed the recipe to almost a T, except for adjusting maybe a couple minutes of timing due to oven heat. You probably did not mix the yellow and white together properly. great recipe.. definitely a keeper! I think the dense base is due to the inadequate mixing of the white and yellow. Make sure it is well mixed. I found that a lot of the yellow batter tends to sink down to the bottom during the folding stage, so be sure to scrape the bottom of the bowl when you fold. You can omit the lemon juice, not a problem. I can’t really help you if you are using another person’s recipe, cos I don’t know what happened. Hihi sorry. Failed 2nd attempt. Looks worse than 1st and not sure why as I used waterbath and use oven temp 150 deg C bake 1hr 20mins. Took out water bath last 12 mins and bake with 130 deg C bottom heat to ensure base is cooked. Pls see photos.. I used same recipe less 20g sugar and less lemon juice only. Pls help. My oven is cornell brand and small. Used oven thermometer to ensure its at 150 deg C with waterbath n cake in before start baking too. But actual oven adjusted to 200 deg C when internal oven is 150 deg C with waterbath. Hope I’ll be encouraged to try 3rd attempt. Very sad with the deflated and ugly cake. Thanks in advance for help and advise. You should just follow the recipe as written in the blog. Don’t reduce sugar or adjust anything. Once you succeed with the exact recipe, then you go and make adjustments. Hi Dr Tay. I just tried following your recipe, omitted only lemon juice and used Top flour.everything followed and used preheated 200 deg C but when open to put waterbath and cake, temp drop to 180 deg c and I bake at 180 deg c for 15mins as my small oven n gets hot easier then 160 deg c for another 15mins using oven temp To monitor. Then let it continue 30mins with oven off. And let it cool 10mins. I got a nice brown top, no cracks, cake didn’t raise high and didn’t shrunk much but still got a dense layer of egg on the bottom abt 1/2 cm. I’m using aluminium whole piece 20cm cake tin as i cannot find 3″ height and cake is quite short now. Lined sides and bottom with brown paper and use a 23 x 23 cm square tin put cloths inside n cake on top and hot water in slightly about 1cm high on cake tin. Really not sure where went wrong. Pls see photo. Thanks. P/S: my nice brown top stick onto my place when I turn to remove brown paper. Hmm..
Its your oven, unfortunately. Can you try to bake it in a friend’s place who has a proper oven? Hmm. My friends don bake unfortunately and seems only cotton jap.cheesecake giving me problems. I’ve tried pandan chiffon, vanilla choc walnut chiffon, egg tarts, choc chip cake with no issues. Really hope to make this cake successful but really no luck. Hope anyone who uses small oven and make this cake successfully help me please. Much appreciated. . Thanks in advance. Don’t overmix or else you can cause the bubbles in the eggwhite to deflate. If you undermix, then the yolk will sink to the bottom, also no good. Sorry, the pics didn’t come through the previous post, here they are. Thanks! It is also ver important that you mix the yellow and white together properly. If the yellow is not mixed properly with the whites, they will sink during the baking process and produce that dense layer. Ok, noted, will definitely incorporate all of your suggestions. Thanks for taking the time to reply! Eh…I should have read this prior to making the cake. Mine came out separated. Fortunately, the top layer is perfectly fluffy and delicious. Oh well, now I have good excuse to bake another one! 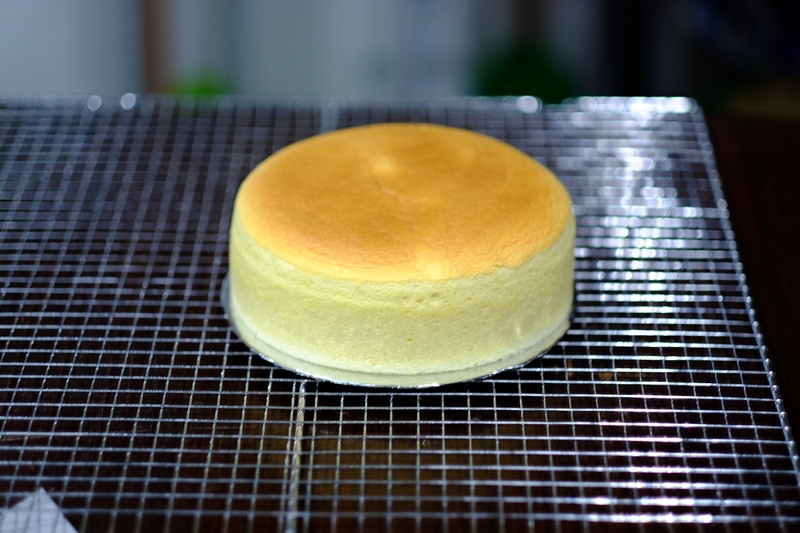 Can Japanese cheesecake wrap with fondant? It can, I made my husband this cake and cover it with marshmallow fondant.. It looks like the top heat is too hot and the bottom is too cold. Did you place the rack at the bottomost rack? My baking tin is the push-up ie removable base type. Can still be used in water bath? Yes, but you will have to make sure it is waterproof by using 2 layers of heavy duty aluminum foil. Do I put the aluminium foil below or inside the pan? Wow, I never tried it before, so if I were to attempt it, I would put the paper cups in a muffin tray, put the muffin tray in the waterbath and lower the oven temp from 200 to 160 earlier. Maybe 5 – 10 mins so that it doesn’t cook too quickly. Alternatively, you might want to try cooking at 160 for 20mins and then brown the top quickly by placing it on the upper rack and turning up the top element to 200 for 3 mins or so. I am only guessing. Thanks so much for your words of encouragement! Excellent! Great job! Your cake looks fantastic! No fan force! Absolutely not! I better pen it in! Thanks for your comment! Your ingredient index show 70g sugar in the yellow team and another 70g sugar in the white team, but step 5 of method only stated to add half sugar, so what happens to the other half? Or should the amount of sugar be 35g yellow team and 35g white team? Total amt of sugar is 140g. 70g to the yellow and 70g to the white. 70g to white, 70g to yellow. Total 140g. When I did the video, I measured 140g into the one bowl and added half to the yellow. Sorry for the confusion. Dip the knife into hot water, wipe dry with a paper towel and repeat after each slice! Use dental floss, not mint flavor! Hold it taut and cut straight down thru whole cake, making three cuts for 6 servings, or four cuts for 8 wedges. how do i post the pic?? Following the baking instructions to bake at preheated 200 degrees oven for 18min, lower to 160 degree C for 12 mins. Few questions I nee your advise Dr. 1.) Do I use top heat + down heat with fan or without fan? 2.) Do I use top heat + down heat through out the baking process? Top and bottom heat, no fan force throughout the baking process. All the best! Thanks for your comment! I never tried low fat milk before, so I can’t really tell you. Its not supposed to be like that. You need to get an oven thermometer and measure the internal temperature of the oven and adjust accordingly. Hi, mine turned out really nice. The top didnt crack at all. I followed your step by step instruction but right after the last 10 minutes where I should leave the oven door ajar, i sliced the cake. The bottom and sides are nice and spongey, but the inside is still a bit wet. Is this ok? I put it in the fridge, hopefully the texture will improve after it is cold. Thank you for the great recipe! I also love chef Yamashita’s recipes! That looks really good! Maybe you can increase the cooking time a little to get the inside less wet. It is supposed to be a little moist. Best is to leave int the fridge. Yes, it has to be refrigerated and can last 3-5 days in the fridge. As long as the internal temperature is the same as the convection oven, I guess. Thanks for sharing. I will go back and edit the instructions. Keep trying! Your next cake will be perfect! Hi Dr Tay, I tried to bake this cake twice over the weekend and it was a disaster. Key issue I have was that the bottom half of the cake was steamed rather than cake like baked. Have you encountered this problem before? Could it be because I have put too much water in the water bath? Also, I used a loose base cake tin as I couldn’t find any light coloured fixed base 8 inch cake tin in New Zealand (believe it or not). I finally found one that is black. Is it worth a try? Or should I get an aluminium fixed base cake tin? Which is of less risk? Appreciate your suggestion! Cheers! Sounds like water got into the pan! Yes, it happened to me once! I wrapped with aluminium foil and a plastic sheet out and I did not see any water inside though. Also, are you able to advise whether I am better off buying a black non-stick or aluminium fixed based cake tin? I really don’t like the idea of using loose base cake tin. Aluminum fixed non-stick pan! You should also get an oven thermometer so that you can monitor the internal temp of the oven. Maybe your oven is not hot enough. Thanks Dr Tay. I did have an oven thermometer and use that extensively. If I get the aluminium fixed non stick pan, does that mean that I will have to line the sides or would buttering the side and dust with flour help? I have already discussed this in the post! You should go back and read it. I did read that but I think I got confused now with the aluminium pan. I am afraid I might have ordered a no non-stick aluminium pan but guess I will see when I receive the pan. Thanks a lot. 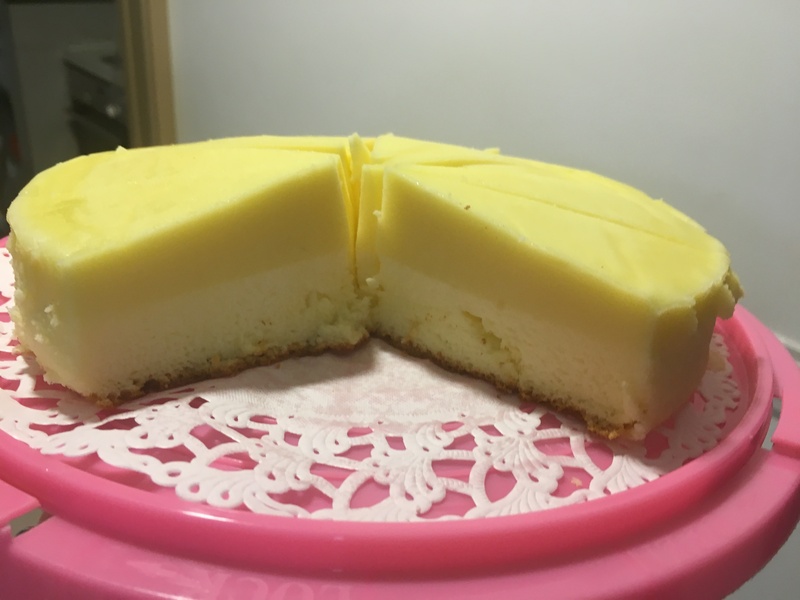 Hi Leslie, this was my 3rd try, making the durian flavored cheesecake! I did not manage to find fresh durian so had to make do with durian essence. What do you think? Big thanks for sharing this great recipe! Looks good! How did it taste? The durian smell is there but flavor will be better if I used actual fruit. This is a picture of the whole cake, can I ask if yours looks like that after it cools down? Wow that is a fantastic effort! Well done!! Looks better than mine! Usually that means that you did not mix the white and yellow together well. Hi. Did a 2nd attempt yesterday and it turned out well. Thank you for ur detailed recipe. Well done! I am sure Dad was really surprised! You can buy frozen durian puree at 717 Trading. Thanks for your feedback. I used a light aluminium pan and did not need to cover with foil. Was yours a springform? If you use a springform pan, you need to wrap aluminum foil around it and that negates the effect of the dark colour pan. Thanks for sharing this recipe. My first attempt base on your recipe is very successful. Cheers! Wow, that is a beautiful cake!! Thanks for your feedback! I didn’t modify as this is my first attempt base on your recipe so I try to fully follow your instruction. I may try put durian version when the season cones. Thanks a lot! Hi I’m trying to bake a soufflé jap cheesecake using steam bake method..
Can these 2 method, steam bath or water bath method, interchange? I don’t really know since I have never tried. The only problem is to get the top to brown. Also my soufflé cheesecake is still wet even after an extended baking time of over 20 mins at 150 deg. The top has cracked and I continue baking but covered the top. Read my post and follow exactly every step. This happens to my Jap Cheesecake. I follow thru your instructions. I saw a hair line crack in the middle at the 22nd minute of baking time then it erupted. No choice then I switched off the oven at 28th minutes. I left the cake in the oven for 30 minutes, keep door ajar for 10 minutes. What would be the cause of it? Noted. Will source for the light color pan. This is really science. Hi Leslie, I tried your recipe for the first time a couple of days ago to the T but when I poured the batter into the cake tin it was really bubble, unlike yours. I folded and didn’t mix the egg whites in. When I turned my cake out, it cracked from the bottom. What would be the cause of that? :O but within 24 hours of baking it, it was gone! My sis didn’t even get a slice! You need to make sure you don’t introduce too much air into the batter when you fold! Well, at least now you have an excuse to make another cake! Dr Leslie – I think yr post has caused a run on 8″ baking tins – Phoon Huat is all sold out!! If only I got paid a commission! I made mine today for the first time and it tasted exactly like fiesta cheesecake. 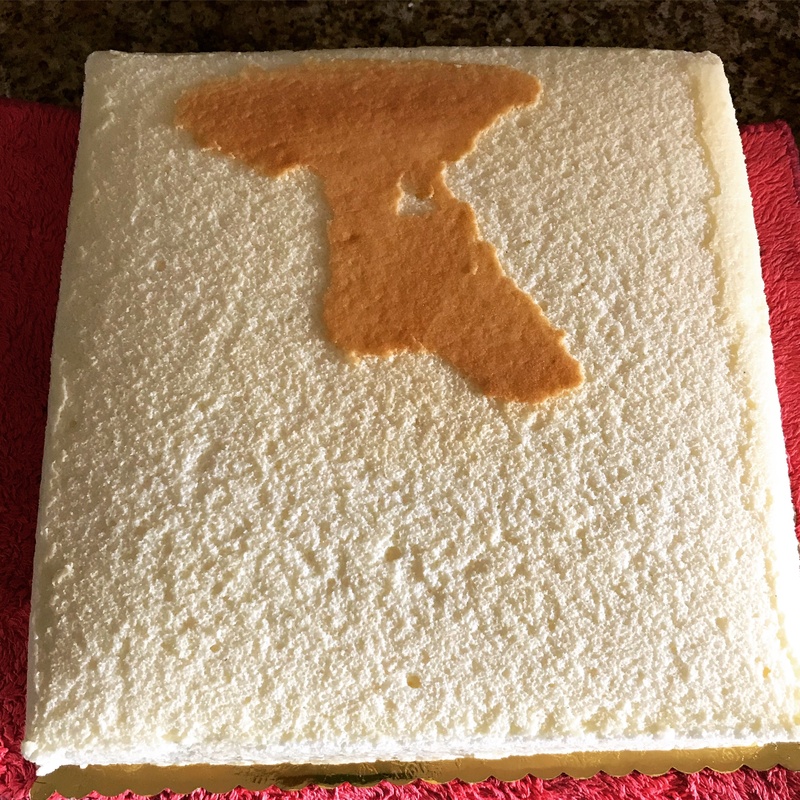 Thank you so much for the detailed guide on how to bake a perfect cheesecake! Thanks for letting me know! I am very encouraged! 1. why not add the lemon juice into the whites instead of the yellow team? maybe you can do away with the cram of tar tar that way? 2. what happens if you over beat the whites? 1. You can try and let us know! 2. If you overbeat the whites, the cake will tend to crack. Hi Leslie, would like to ask how would the temperature and duration be like if I bake the same cupcakes liners? I haven’t tried it yet so I can’t really say! Finally I found the proven science behind the beautiful Japanese cheesecake. My first attempt turned out to be amazing! Thank you for solving all the myths that I’ve been struggling with for very long time. I stopped baking cheesecake for a while cause it’s so painful to see it rise n fall n wrinkled up. I love your great tips and I’m using them to draw reference & learnings for my deflated Ogura cakes! Hope I can fix it soon. Thank you for solving all my myth about the perfect Japanese cheesecake. My first attempt turned out to be wonderful! Top a bit too brown as small oven & too close to top heat. I’ve tried many times of different recipes before this. I stopped baking it for a while cause it’s a pain each time to see it rise & fall & wrinkled up. I love your wonderful tips and perhaps can draw learnings to fix my deflated Ogura cakes! Thanks for your encouraging feedback! Left out the pictures in earlier comment. Yet to slice it, hope it’s good inside. Hi Dr Leslie, my oven ‘Teka’ is unable to turn off the fan force. Do you think with the fan force on, it will affect the end result? Thanks. Yes it will. You may have to set your temp 20 degrees lower than what I recommend. I was attracted by the great photos from your receipe. I believe this receipe which with nicety picture presentation will lead me to the correct way. I am right! I used a 7″ square cake tin and water bathed in a much more bigger tray that with uneven space around cake tin, and I adjusted the temperature a little bit as my oven only has fan forced option, 180 for 18minutes and 140 for 12 minutes, turned off oven and left in oven for 40 minutes. However as my first attempt, the result was far more better than I expected. My husband was impressed by the taste of the cake! Thank you very much for the awesome receipe and the detailed tips to avoid fail. I was attracted by the great photos from your receipe. I believe this receipe which with nicety picture presentation will lead me to the correct way. I am correct! I used a 7″ square cake tin and water bathed in a much more bigger tray that with uneven space around cake tin, and I adjusted the temperature a little bit as my oven only has fan forced option, 180 for 18minutes and 150 for 12 minutes, turned off oven and left in oven for 40 minutes. However, as my first attempt, the result was far more better than I expected. My husband was impressed by the taste of the cake! Thank you very much for the awesome receipe and the detailed tips. That’s a lovely cake! Congrats and thanks for writing back! Very encouraged. Well done! Looks good! Thanks for taking the time to post your pics! My first attempt and we used half the recipe as an initial experiment. I’m really surprised by the colour, texture and taste. I expected it to flop but it turned out pretty well! Thank you so much for your recipe! My mum and I tried it for the first time and it came out nicely. Thank you for this easy to follow, GREAT recipe! Have baked a couple of times using this recipe and it always turned out great with a nice dome, perfectly browned, however it cracked once when I tried to do some drawings on it. It cracked exactly along the drawing lines. Any idea what could have gone wrong? Many thanks!! Try adding less chocolate powder. If the density of the batter is the same, it should not sink. Hi Leslie, its me again. Did the cheesecake twice, both are good! Sharing my pictures for boh tries. Thanks for sharing! Wow it looks excellent! Well done! Hi Doc can I know for how long do you preheat the oven? Finally , after one night in the fridge, I cut and ate ….OMG !!!! Thank you so much for the greatest techniques and knowledge sharing with us. Well done! That is a mighty fine looking cake! Thanks for sharing! Hi Dr Leslie, thanks so much for this wonderful recipe! i’m lousy in the kitchen but the two times I tried this, I managed to get a really pretty looking cake. i had one problem though: the bottom layer of my cake – coincidentally the part where the water bath rises to – seems to have a bit of the texture of a pudding, and is not like the fluffy texture of the remaining two-thirds of my cake. will you be able to help with this? i followed all your instructions to a T, but i noticed in your video that when you took out your cake from the oven, the water bath was no longer present. i left the water bath until i removed it from the oven. should i have taken it out earlier? Did you use hot or cold water for the water bath? It should be hot. Also you need to make sure you mix the white and yellow well or else the yellow will sink to the bottom causing a dense layer. I tried your recipe and all the tips, it works perfectly. Wonderful! I have reviewed many recipes I have to say yours the best. Well done! I would like to check with you if you bake your cake entirely (for both 200C & 160C) using top and bottom heating function, without fan forced? Can you share more on the pros and cons for both top & bottom heat and fan forced functions respectively? I am a bit unsure which function to use when it comes to baking my chiffon, cheese, sponge and other varieties of cakes. Appreciate if you could share more on your thoughts. When you use the fan force function you have to lower the temperature by about 20°C. Most bakers tell me that they don’t use fan force. Hi, can I check w you, if I don’t have cream of tartar, can I just replace it with lemon juice? Where can I get the cake pan which is 1/3 bigger than the 8 inch by 3 inch cake pan from? Where can I get the low gluten flour that you used to make this cheesecake? Well done!! That is one mighty fine looking cake and the photography is good too! Looks like your oven not hot enough. Did the water seep into the cake pan? Success!!!! First after so many times in the past with all the problems that you have posted above…. Thank you so much for the great advise and recipes!!! Well done! Great looking cake! wow your cake is amazing! I tried 3 or 4 times this cake, always with variations because savour was perfect but it was so bad looking. My problem is that I’d really love to make this cake LIGHT, and with 6 egg yolks it isn’t.. I always put 3. Do you think I can bake a good looking cake with less yolks? Thank you. Is the recipe that you posted on facebook the correct recipe or is this the one? What are the differences between them? Maybe your oven is not hot enough. Get an oven thermometer and measure the internal temp of your oven. Hi Dr Leslie, may I know how do u get ur cake to be so “sponge-like”? Mine looks a bit denser compared to yours. This is my 3rd attempt. 🙁 Could it be too much water in water bath?? Appreciate your kind advise. Thanks! Probably has to do with how you whip the egg white and how you fold in the yellow and white. You need to be gentle with the folding. If you over do it, the small air bubbles will all deflate. This is the image of my cake. Bake the cheesecake today and it taste great. Please comment if there is any room for improvement. Bake the cheesecake today and it taste great. Please comment if there is any room for improvement. Thanks. Hi, thank you very much for the detail steps. This is the best cheese cake i have baked so far! Btw, When i bake other cakes, does the same principal apply? Meaning to say when internal temp is 75c i can turn off the oven as the eggs r already cooked? Haha jz wondering! Well done! Thanks for letting me know! Yes that is what I mean! What if I cannot find cream of tartar? Can I use something else to replace? hi Dr Leslie, its my first time to try out baking. may i know what brand/type of butter u use, salted or unsalted? Unsalted butter. Any brand is fine. Leslie… OMG!!! You’re a God sent! I followed every recipe and method to a T except I was too lazy to grate lemon zest. But this came out amazing! The taste is YUMMM! My mother-in-law thought so as well, which means extra points for me. Will be making this often, for sure! That is a mighty fine looking cake! Glad the recipe worked for you! Yes, impressing the mother-in-law definitely has long term positive repercussions! Are you an engineer by any chance? I followed your steps but the bottom part became like a custard. Do you know why? Thank you! Oven may not be hot enough. Did you measure the internal temp of the oven? Thanks for letting me know and for sharing the video! I was just wondering, if I don’t have any acces to glazing gel, is there any form of substitute? If you use a ramekin, the internal temperature will not be the same. Best to use a metal baking tin. k will try again, thx much….most 8″ with 3″ height cake pan is out of stock, if I use 9″ wide and 3″ height pan, what changes do I need to make to the recipe? how about baking time and temperature? Mind I know if we can do without cream of tartar? Yes you can do without it. I feel your pain! Oven too hot! Huat ah! Do you have an idea of how much I can decrease the sugar without affecting the structure too much? Can I reduce it by half? Also, I’m curious if you have a picture of what it looks like AFTER you refrigerate it…you said it looks best right when it comes out of the oven so you take your photos then, but I want to know what it looks like the next day too hehe. 😉 Thanks!! I can’t comment about how much you can decrease the sugar. The cake looks wrinkly on top after a day in the fridge. To prevent it from happening, I have to glaze it. The temp should be the same. Maybe the baking time needs to be adjusted. Not easy for me to tell you definitively. Thanks for all the tips! The first time I followed your recipe, the top didn’t rise and didn’t brown. I got an oven thermometer the next day and found out my oven is 45F/7C off!!! That’s a huge difference! Anyways, I finally got the cake to rise and brown properly, but I can’t figure out the cartoon piping part. I didn’t scrape the bottom of the batter after pouring it into the pan, sifted some cocoa powder into the leftover batter, and mixed it, but it was so watery that as soon as I poured it into the bag it came out the tip like a water fountain, so it was impossible to write with! Did you add anything to thicken the piping? Should I add cornstarch or something? No, I did not but I find the piping bag a little difficult to use. Eventually bought a special piping instrument. You can find them at baking shops. Hi, I’m using convection oven with rotation plate. I’ve tried baking but the cake crack and abit dense at the bottom. Is there any difference in other type of oven? I followed the instructions you gave. Hi, I’m using convection Oven. But why it comes out bottom dense? Hihi should I use salted or unsalted butter? 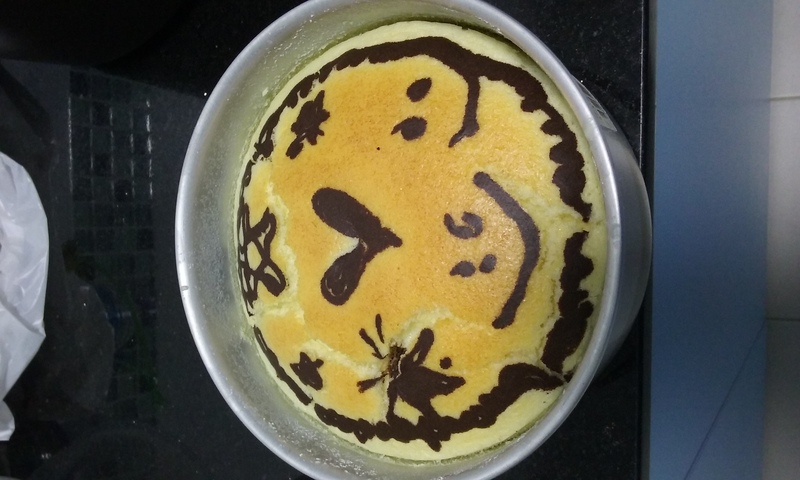 Hi, thank you for this detailed post… I am one of those who make a delicious but bad looking Cheesecake… I’d like to try with your recipe (maybe today, if I can found a cake pan -I have only a springform pan and yes, water seeps into the cake-) but I have to admit it, I will try to use less egg yolks and to use some yolks substitutes… Are you already trying to dissuade me? 😀 The problem is that I LOVE this cake also because it’s so light & healthy… but I usually use less yolks, because if I use 6, it’s not that light… Anyway, my question is… do you think I can use a silicone mold? Thank you! No harm trying but I have not tried it before. I really want to thank you. Yesterday I tried to bake it again and I’m really satisfied of the result. It isn’t as perfect as your cheesecake, but sides are great and top isn’t too much creased… It still doesn’t compare to my previous bad attempts, and hey, I used just 3 yolks and a dark colored pan (the only one I could find). Just a question: when I turn off the oven and leave the cake in closed over for 30 mins + 10 mins with slightly open door.. do I have to leave the cake in water bath or no? I’m asking it because the bottom of my cake was a little bit too moist even if it looked well baked for me (I left it in water bath). Thank you again. I show you my creation for a better judgment. Looks good! If you are happy and everyone else is happy then that’s it! I’m sorry, I don’t want to bother you, maybe you didn’t see my question? I’d like your advice as you’re a master of this cake. When I turn off the oven and leave the cake in closed over for 30 mins + 10 mins with slightly open door.. do I have to leave the cake in water bath or no? I’m asking it because the bottom of my cake was a little bit too moist even if it looked well baked for me (I left it in water bath). hi Bea, there’s a comment all the way below stating waterbath inside oven all the way until the final stage of removing the cake when done even during the 10mins cooling time. Hope it helps. My 2nd attempt failed miserably.. Try to separate the cake from the pan by gently using a blunt knife. Sure but it will depend on the composition of the cream cheese. You might want to lower the heat a little since it is close to the heating element. Use an oven thermometer to measure internal temp of the oven. Hi thanks for sharing. I made this cake successfully by following your recipe. I really want to try Durian japanese cheesecake for the next time. Read your guide, i have some confuses. Just only puree 250g durian fresh & 100ml milk to make a mixed? How about other ingredients in Yellow team (i mean 60g butter)? Do i cut it off or keep it? Maybe you did not mix the yellow and white well. Maybe water seeped into the cake tin? Are you using fan force? Don’t. Just use normal oven. You might want to reduce the time at 200C to 15 mins. I think your oven temperature not hot enough. Hei, you mentioned that the cake will shrink from the side of the pan. Is it normal that it would sink too? Texture is still fluffy (and there was no dense layer) but the height of the cake dropped about 1 to 2 cm from when it was baking. My cake came out perfect, not a blemish on it but when I cut into it the bottom of the cake was thicker like a custard and the top half was the nice cheesecake texture I was hoping for. Can someone help explain this? Could be the yellow and white not mixed well. Just baked this cake today. Just to share you can get the cake tin from Bake King it’s $9.50 just ask the staff for grey color nonstick 8″x3″ cake pan. That is a mighty fine looking cake!! Hi Dr Leslie, is this what you use to draw on your cheese cake? Yes, I use something like that. 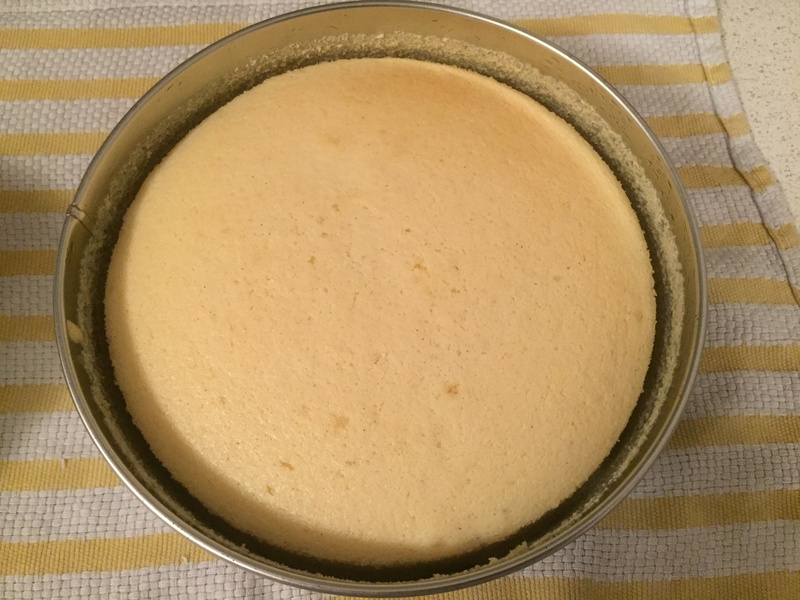 The first time I attempted japanese cheesecake, I used a recipe that said to use a springform pan wrapped with foil to prevent leaks. Alas, it ended up leaking and I was so disappointed that I stayed away from japanese cheesecakes for awhile. Then, my lovely fiancè found this recipe posted on the food subreddit and since you backed the recipe up with science, what could possibly go wrong? I went out and diligently sought out all the ingredients and tools amd tried a crack at it. The first time, it came out perfect, it tasted perfect and we finished it in an entire day. I attempted it again a few days after, just to make sure it wasnt a fluke the first time round, same results! Delicious, soft and fluffy. Then I made it a 3rd time just for the heck of it! Which we devoured the next day after patiently refrigerating it overnight. My only issue with the cake is the flipping part of the depanning process. The first 3 times, I used baking paper while the cake was warm as suggested – the whole skin came off on the baking paper. The 2nd time, I used a glass plate while the cake was warm -only the inner part of the skin came off. The 3rd time, I depanned it after refrigeration, with baking paper – skin came off too. The skin was sticky and thick, like a pavlova you’ve refrigerated overnight. Do you have any idea what to do to help? I might risk using a springform pan next time just to try properly depanning it. But besides that, this is a wonderful recipe. It’s perfect and tastes so good! Usually I depan it on wax paper while it is warm and its ok. Maybe you can try a non-stick pan? Its got to be warm not cold. I’ve just pulled my caked from the oven, it unfortunately has a crack on top, but i’m determined to try again another time…. my question for the moment is, to store in the fridge, do I wrap it with something like cling wrap or place it in the fridge ‘naked’? You should put it in a plastic container of some sort so that the top doesn’t dry out too fast. That is a nice looking cake! Well done! Thanks for your kind feedback! Hi Leslie, thank you for sharing your secret recipe! I’ve tried to bake a decent Japanese cheesecake 20 times but none of them worked. Finally I managed to bake it “90% successfully” after reading your post. The bottom 1cm looked densed and all lemon zest sinking to the bottom. I guess I did not mix it properly enough. When I poured the batter into baking pan I could see yellow batter and white batter like separated, I should insist to mix it better. Once again, thank you so much for your tips! Hi Dr Tay, I’ve been following your posts and this is one recipe which I couldn’t get it right at all even after 6 try. Wonder if you can advise on why there is a kueh layer and today bake is an uncooked cake despite following your temperature setting almost closely. 1st to confess I used all the ingredients stated except I opt out the lemon n vanilla extract. I used Meiji fresh milk. My oven temperature is 180 deg even though I set it to 200 as shown on my oven thermometer. I dare not raise it to get the exact 200 deg for the 18 mins of bake as 15 mins into the baking, the top already burnt real fast that I had to put a foil to shield the top heat. This ends up with an uncooked cake as seen on the last photo. I took away the water bath pan & baked for 20 mins at 160 deg this round. Is there a way to know what should be the correct temperature and timing for my oven? I only managed to get it right on my 1st try and thereafter the rest are disasters. Looking forward to your advice. Don’t use boiling water in the bath. It should just be warm. All the best and hope it comes out perfect! Thanks for the recipe!!!! It’s really never crack!!! I have tried 2 with another recipe, both are crack then I am so frustrated to asking Mr.Google about why why n i found your page!!!! I read your writing for 3 times, highlighted which I should be more careful n I was so kancheong during the whole process!!! Appreciate all the notes in so details! I am a beginner N I have learned from your post. The dome is super pretty just a bit chao ta (over bake) due to my oven is smaller, the top grill is too near i guess. My oven is 25L only, then I was so worry that I must to reduce the temp since Its’ heat like always higher, can be overbake than the standard recipe, so scare that it cant be bake well if follow the procedure n timing with lower temp but it is done well from outside to inside!!! I cover the aluminum foil at 20th mins but i think I should do this on the 10th mins. Hi Dr Leslie, thank you very much for sharing your detailed instructions. I made this for the 1st time yesterday and it was really good. The cake did not break yay! 🙂 However the top of my cake was slightly burnt and there is abt 2mm dense layer at the bottom. I used brown caster sugar, will that be fine? For the oven temperature for the first 18 mins, should I use 200 c or 180 c? to avoid having the dense layer , is the only way to mix well? how to ensure that I mix it well without over mixing? To avoid burnt top, should I reduce the temp? I used 200c for the first 18 mins. For the chocolate powder, may I know how much did you add to the mixture? I find your brown color very clear and dark. Last question, do you place the cake in the fridge overnight once all the steps are completed? Thank you very much in advance! can we subtitute the full cream milk with liquid whipped cream? Hi. I tried the cheesecake and it turned out well the 1st few. Until few days a go i try to do again,and it doesn’t raise. I did everything the same,it strange, i tried 3 times and all failed. I really can’t figure it out why…. Getting so frustrated with it. Perhaps anyone know why? Did you use boiling water for the water bath? I haven’t tried before. But cocoa is a little acidic so you may have to balance it out with some bicarb of soda. But I can’t really tell you how much. Pic 1: I failed at my first attempt.. My batter doesn’t even fill up half the pan.. and the cake ended by super dense.. I read somewhere that the dense cake might be due to the leftover liquid egg white (instead of soft peak) which was mixed into the batter? Pic 2: During my 2nd attempt, there are still some egg white at liquid state after whisking till soft peak. I mixed the soft peak egg white into the batter and tried beating the remaining liquid egg white again, but it just does not foam up. This time round, I didn’t mix in the liquid egg white so the batter is still less than half the 8 inch pan. The cake is only 1.5 inch tall and it still look dense. How can I ensure that all the egg white is at or near soft peak? How can I get the soft fluffy jap cake? 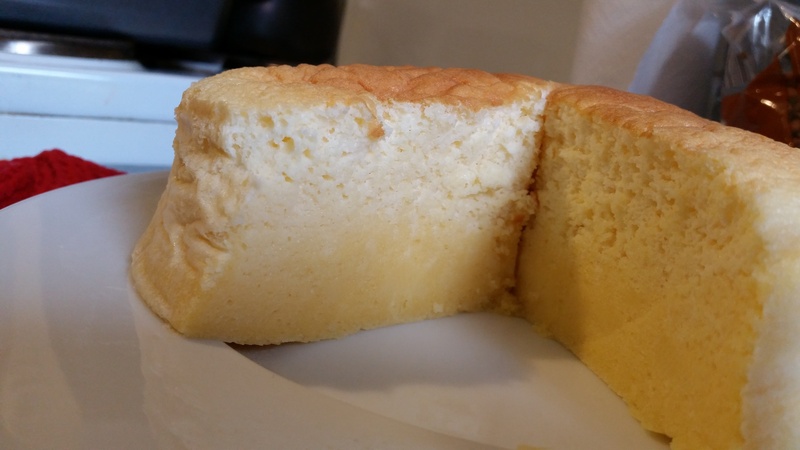 Hello, I’ve tried 3 recipes ( including yours) of Japanese Cheese cake, and confirmed among all with 1hr and 10 mins baking time, yours,comes outs perfectly (trying it 2x) ( no crack, and perfect shape and color), I just wonder why it always comes out a little dense on the bottom part, I combined everything well but not over mixing it, could it be needing more baking time ? Did you put boiling water in the water bath? your cake looks really great! I tried your recipe 3 times and is plaque by the same issues. My cake doesnt crack, but it segregated into 2 layers. The top later being the moist and cottony layer. The bottom layer looks like pudding. Not really sure what seems to be the issue. Could it be that i tap the cake pan too hard and too many times, resulting to the fine bubbles being released. Or was my mixing in of the whites not done thoroughly? Or could it be my whites are not properly whipped up? Or is my cake underbaked? I put the cake into the oven almost immediately after pouring in the batter so that it is not left stagnany for too long. But the same issue still persist. Did you put boiling water into the waterbath? It shouldn’t be boiling. Just warm. Hi – I am thinking of using half the portion of the recipe. May i know the size of the cake pan I should use instead? Suggestions are appreciated. Thanks! Tis a difficult question! I don’t really know! Hello Dr Leslie 🙂 First of all thanks for sharing the recipe and knowledge of baking. I have learnt a lot from you. 1st attempt I used half the recipe and added a teaspoon of matcha powder. It’s so yummy and I love it. Will try to bake again soon. Hi I have tried baking the cake today following the recipe but the bottom has turned out all wet with water and soggy. I tried a second batch that is thinner but there is still a thin layer of uncooked right at the bottom. Is it because It is uncooked? Is there any point I can do a check to make sure that it’s cooked before offing the oven and keeping the cake behind closed oven door for 30 mins? Please advise. Hi, I wish to bake just a 4″ cake so should I half the baking time too? Thanks for this. The recipe is great! I probably just need to use a temperature probe because I have an old oven so it probably did not hit the right temperature which caused the bottom middle part of my cake to be a little undercooked. I had to keep it baking for a little longer. Otherwise, my cake turned out pretty great though! I’m attaching a picture of how it looked. Thanks again! question is,can i bake it in a 9-inch round?..and right now i only have the dark, non-stick springform pan,will it greatly affect the finished cake? and lastly,i dont know where to get the glazing gel,can i use corn syrup instead? This recipe is based on the kind of pan that I used, so if you use another type of pan, it may affect the result. You can get apricot glaze at Phoon Huat. Hi, I want to say thank you so much for your tutorial.. It’s really amazing how you describe all the methods scientifically. Yesterday I finally gathered courage to bake another JCC after 2 miserable failed attempts few years ago (I thought it was kinda JCC curse for me then.. Haha). I was really nervous during the process. But i’m so thrilled to say that my JCC turned beautiful thanks to you. Unless the wrinkle on the side because I’m lining my pan with parchment paper & wrap my pan with foil ( I couldn’t find non stick pan in my city, & my pan have seam on the bottom so water could seep through it). Never taste the actual JCC from fancy cake shop, but this cake tastes like heaven. My family loves it very much. One question, what actually would happen if we bake it in fan forced oven? I have another oven which is fan forced only gas oven, with bottom heat, separate setting for upper heat. Wow, that is a mighty fine looking cake! If you oven is fan forced, you will have to adjust the temperature 20 degrees less. That is the conventional wisdom. Maybe if the top is browning too much you might want to put a tray on the top rack of the oven. So sad, the first 18 min my cake already raise until like that. May I know what is the prob ? Is it because of I din use the size that u mentioned ? I used 2 6″ tin instead. The water bath seems a bit shallow. Usually that has to do with your oven and your water bath. Had tried this recipe…the only problem is the cake turn out too dark on the surface. I had followed the baking times and temperature. Could it be the temperature oven was too hot? Maybe you have to put the cake lower in the oven or put a tray on the top rack to block the top heat. Make sure its not fan forced. Hi i had put the tray on top of the oven to block the top heat during the first 18mins with 200’c oven temperature but the cake did not turn brown and I took away the tray at 12 mins with 160’c , the cake colour light brown but cracked. How do I prevent it from getting cracks? Hi i have been trying hard on this recipe but all the time I find my cake cracks. I have even put a tray on top of the to prevent heats from the oven. What was my mistake as I have follow every steps of it..? thanks to your reply. the 2nd attempt i had tried had cracked in it even though i had reduced the oven temperature to 180’c. maybe i should have try putting a tray to block the heat in the oven. hey may I know why this dense layer always forms at the bottom of the cake? I’ve tried your recipe twice and it happened both times… I never got cracks at the top of the cake though! I have never tried it, but I would try using chocolate powder or the concentrated chocolate which you can buy from bakery shops. Chocolate is acidic so you may need to balance it with some bicarbonate. I woudn’t know how much exactly. hey it’s my first attempt and the cake top browns perfectly but the only problem is about 1/4 of the bottom layer is really dense while the top part is really airy and fluffy. Any idea whats the problem? Are you using a springform pan? If so the water could have seeped in. hi…my friend was just wondering what the temperture and time show be if she is going to use a 9×2 in cake pan. Did you use a springform pan? The water in the water bath should be warm but not boiling hot. Hi Dr Tay, it is my 6th attempt today and after every disappointment I wld modify one item that I used to be exactly the same as yours. Like buying an oven thermo, buying the same cake pan etc. but I still have the same problem which is the apparent kueh layer at the bottom. I read through the rest of the comments here and this is a common issue. Any chance you’ll like to solve the mystery for us? I did. The warm water from the double boiler step. What brand of cream cheese did you use? I leave it in the oven until I remove the cake. Try to use a shallower outer pan. Hot air should be allowed to circulate around the cake pan. Don’t use half the recipe! Use the recipe as it is written with the correct size pan! Hi doctor leslie, I have baked the cheesecake 3 times and each time I do so I end up with a dense bottom although I baked the cake at the lowest point of the oven and have used and oven thermometer to check that the temperature is correct. Could this be a result of using a cloth that is too thick? It is really annoying as the top half of the cake comes out perfect Hahaha. Yes, this is an annoying problem which a lot of people are experiencing. Did you use hot boiling water in the waterbath? It should not be boiling hot. Also if you are using springform pan, you should line the outside with aluminium foil. Good morning Leslie and thanks for the reply! Yes I did use hot boiling water. I bought a light coloured pan like you have advised. The pan which I used as a water bath was a thick wmf pan which I suspect is simply to think for sufficient heat to go through. So i will buy head out to buy a simple metal pan like the one you used for the hot water bath and possibly omit the use of the cloth. The top half of the cheesecake was very very good and I will try it for the 5th time! Have a great day doc! Ah, that seems to be the common problem. Try boiling the water before you start making the cake so it has some time to cool down before you add it to the waterbath. Please let me know if this solves the problem. OK thanks. The trauma is too great and I would need to summon more courage for my 5th try. Hahaha. Any luck? Sigh. My 6th attempt today and still it came out with a layer of kuehish custard at the most bottom layer… I even bought new oven thermometer and sat right at the oven throughout to monitor the temp! Hi, would like to know when you off the oven and let the cake sit for 30 minutes, do I need to take out the water bath? or only take out after the 30 minutes? Leave it inside. Don’t open the oven! My first attempt! Thanks for the recipe! Well done!! That is a good looking cake! Hello, thank you for sharing this recipe ! I’m gonna try it out this new year however, I do not have cream of tartar in my pantry. Is there anything else I can substitute with when beating the egg whites? Thank you so much for the recipe. My family and friends really enjoyed it lot, it was heavenly, very light and tasty?? Oh, that looks mighty fine! Well done! Looks really good! If I were to make a matcha Japanese cheesecake, how much matcha should I add to this recipe? I just tried this recipe. Just popped it into the fridge to chill, hope it tastes good. Good thing is the cake didn’t crack at all!!!! (Yay) But it turned wrinkly as it cools which is kinda sad lol. And when I was de-panning it I realised the bottom part didn’t rise well :/ Followed the instruction exactly, may I know what possibly went wrong?? Thanks, glad you like the recipe! Hi Leslie my second attempts on making this Japanese cheese cake. I am still getting the heavy bottom layer. I followed your instruction to the T. What am I doing wrong? Your reply will be much appreciated. Thank you. Make sure the yellow and white teams are thoroughly mixed. Sometimes the melted butter is left at the bottom of the bowl and doesn’t get mixed in properly and sinks down during the baking process. The water in the water bath should not be too hot, just warm. Don’t use too big a tray for the water bath or it will affect the oven temperature. My first attempt was more than great, however, I tried to decorate the cake and the Chocolate batter sunk to the bottom! Why is that? It wasn’t too thick, and also I tried not to stir the mixture a lot while placing it in the oven… What could have had happened? Too much chocolate powder, I suspect. And don’t stir it too much, or else the batter will lose all the bubbles and become denser than the cake batter. ok, so I baked another one, and followed your instructions and the design held beautifully! However, when I opened the cake I did yesterday and the one I baked today, I was disappointed to find that they were DENSE, all the way through! SIGH! it fooled me because the cake domed a little and also had bubbles on the outer layer, but both cakes were all dense in the inside, not just a layer. I’m baffled. I followed the cooking times and temperatures, 180C for 18 mins, then 160C for 12 mins, then oven off for 30 more mins…. I am sure, I have an oven thermometer. 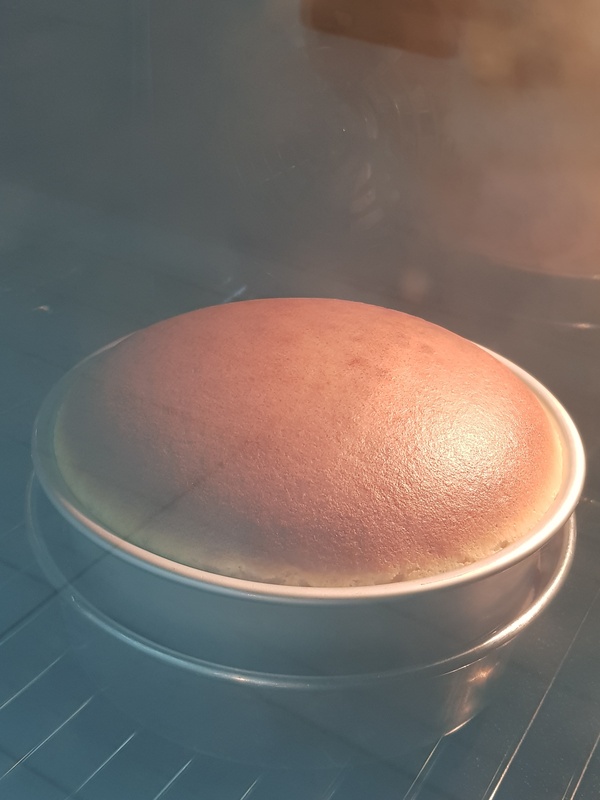 The only thing that is different in mine is that I dont have heat on the top, it is a gas oven, and thus the cake will not brown, and also it loses temperature at a much faster rate once it is turned off (by the 1 hour mark it is not 110C as expected, but bellow 50C!) Could that be the problem? I do not know what to think. The oven is the problem. You might have to try the more conventional 160C for 1 hour 10 mins and see how you go! Thank you for your answer! Will try this and let you know how it goes! I want to make this asap , my question is that in which stage should i remove the water bath , because in the video the last step of the oven there was no water bath so i was wonderin when should i remove it? You can just leave it in the waterbath. In doing the video, I had to do a few takes. After 4 failed attempts of baking with other recipes, i am so happy that this recipe did not fail me. Although it’s not perfect, but it’s good enough to make my day. Thank you, Dr. Leslie! There was a slight mishap though, as your recipe indicates the adding in of flour to the yellow team, before moving on to whisk the egg white. I noticed the difference after viewing the video. Anyway, the cake tastes great! Just want to thank you for your recipe and explanation. So far, i had bake 3 times this cheese cake and come out perfectly. Really very appreciate your recipe. thanks again. Thanks for letting me know! Glad you are successful! Hi, yes I actually have the durian cheesecake recipe written up already. You need to add 1 more egg white, increase the cake flour to 70g. Bake 18mins at 200, 20mins at 160 and 10mins at 140 and turn off oven 10mins. I will post the recipe soon. Thanks so much. I’m planning for this to be my “durian off season” savior when I can’t get fresh durians. Frozen durians seem to work well for baking. Are you still using the 8″ x 3″ pan or did you need the 9″ x 3″? Hi Leslie, thank you so much for your detailed write-up! I made mine today, and while there was a bit of cracking, the sides are nice and light, overall I am happy with the results. I have a quick question which is, when you’re whisking the Yellow Team ingredients over the warm bath, did you use an electric beater? I found it quite difficult to soften the cream cheese using a hand whisk only. Thank you! I just use a hand whisk. The trick is to let the cheese warm up a bit first. Are you using a spring form pan? If so water might have seeped in. The other thing is to make sure your water in the waterbath is not too hot. Hi . I try this recipe yesterday. But I found out my bottom cake get hardy. Did u have any idea why my cake turn like this? Is it I over bake ? This was my attempt at this cake. Made a few changes to some of the ingredients and baked it at 160 degrees celsius for 70 minutes like Dianna’s recipe. Still turned out decent 🙂 Thankyou Dr. Tay for the recipe!!! Oh, that looks mighty fine! Well done! Oh, I haven’t tried it before so you will have to experiment! Hi, my cake end up to be spaceship, I only baked at 190 for 10mins n my cake turn brown, so I change to 160 and baked for 15mins, my cake turn into spaceship, then I continue to bake for another 10mins for 130., May I know what went wrong? You did not use a waterbath! I seldom write comments, however this time I must thank you for your marvelous recipe! 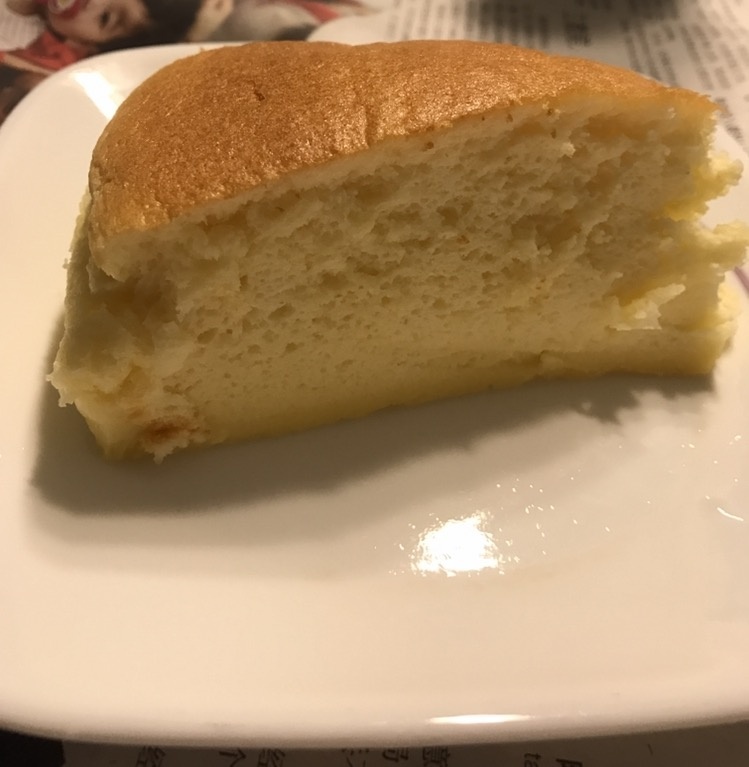 I had been baking Japanese cheesecake for many times… though they tasted good, still the cakes will shrink and didn’t look nice for presentation. I accidentally saw your post and decided to try out. 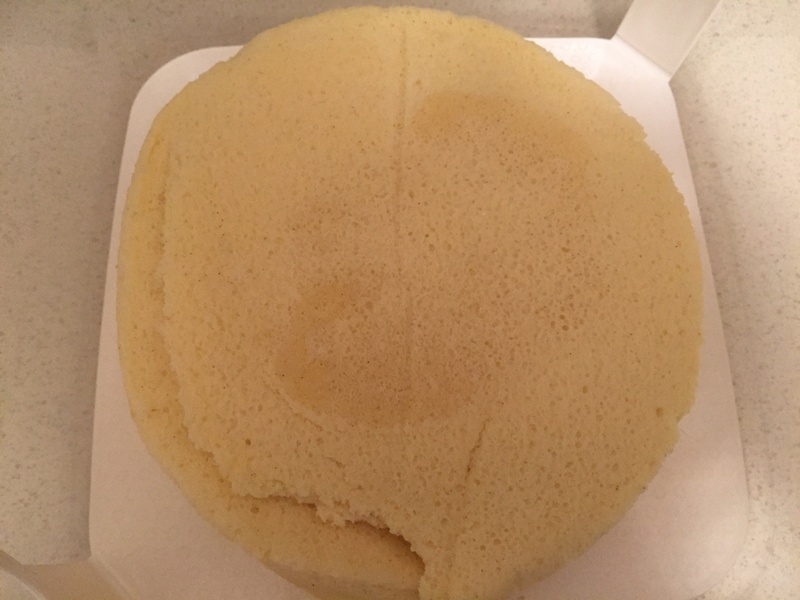 It’s the first time I got my Japanese cheese cake without shrinkage! All the while I had beaten the egg white too much, and I think the baking temperatures are also crucial. Once again thank you for your generosity to share this recipe. That is a fine looking cake! Thanks for your feedback! Thank you so much for your baking process. 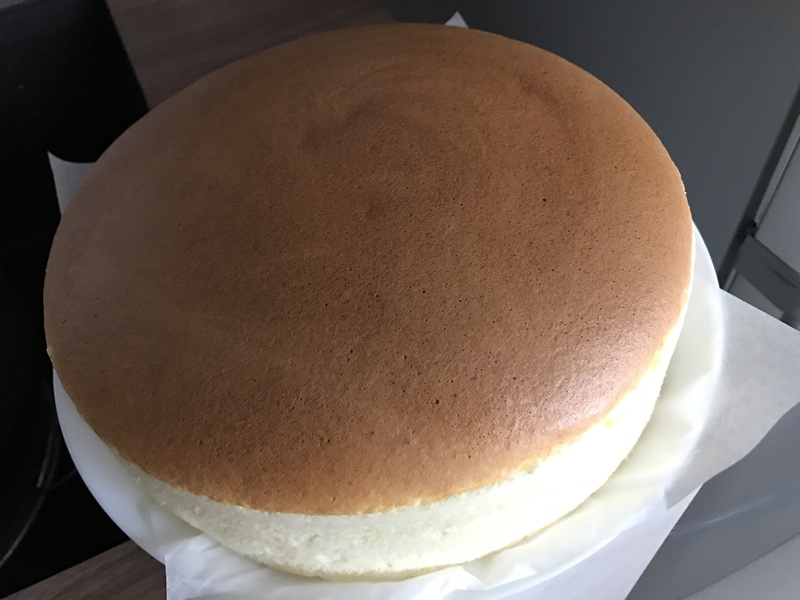 I’ve baked more or less 10 japanese cotoon cheesecake, and they either came out full of cracks or they just sank once out of the oven. I tried your baking method with my 52L oven and my cake came out so beautiful. I changed the baking time a bit though because my oven top heat is quite high: I baked at 200 first like you said, and at 12 mins I saw that the top of the cheesecake was already browning so I quickly opened the oven and put a sheet of aluminum foil on top, reduce to heat to 160 for 18 mins, and the rest if like you said. Congrats! That’s a nice looking cake! Thanks for your photos and feedback! Numerous bakers have vexing problems of their cakes having a dense gummy layer at the bottom. I believe I know the cause and have the solution. I baked this souffle cheesecake without the gummy layer. But I had a gummy layer many times when I baked a famous writer’s butter cake, which didn’t require to be baked in a water bath. I eventually solved the problem and baked the cake without the gummy layer. The fact that the same recipe (this souffle cheesecake and that famous butter cake) has been successful with many other bakers shows that the gummy layer problem is related to my method and not an ingredient proportion problem. There is a common pattern with cakes ending up with dense gummy layer results. The batter is rather wet. The recipe contains a high proportion of liquid. When the batter is fully mixed, all the ingredient components combine with each other. If the baking temperature is insufficient, the cake takes too long to set (since it has so much liquid), the heavier starch (from the flour) can’t hold on and separates from the lighter protein (mainly from the meringue’s egg whites) and sinks to the bottom, resulting in the dense gummy layer. However, this gummy layer is not right at the bottom. Below the gummy layer (which is 10mm or so thick) is a thin layer (approx 5mm) of properly baked cake. That’s because a thin layer of batter right at the bottom did receive enough heat to cook properly. But there wasn’t sufficient heat to cook the batter further up, then the starch separates and sinks to lie above the bottom most cooked layer. This starch layer is however missing the proteins and aeration of the rest of the batter. Then after 1 hour of heat, it does get cooked, but not into a fluffy cake, instead into a gummy kueh. The solution is to increase baking temperature. Bake higher temp than what the recipe recommends. Perhaps the thermostat is not accurate. Perhaps the baking pan is made from a less heat conductive material. At a sufficiently high temperature, the batter sets before the starch and protein could separate. Perhaps those who experienced the gummy layer problem can try baking at 220C for 18 minutes, then 180C for 12minutes, etc. Filling the water bath with warm water (instead of straight from the tap) also prevents delayed cooking of the batter. Wow, that sounds very plausible indeed! Thanks for sharing, Soo! Wow, that is a beautiful cake! Congrats! As long as you are happy with it, its fine! Dear Dr. Leslie, may I know when to remove the pan from the waterbath. I saw your video the pan went in oven with waterwaterbath but out without it. Thank you so much for your attention. It doesn’t really matter. You can just leave it in the waterbath as the oven cools. Hi Leslie, can u pls make a chocolate version? Oh, haha. OK I will think about it. This may sound like a stupid question. When do you glaze the top? While the cake is still in the pan or after you have remove the warm cake from the pan. Glaze it after you remove it from the pan! Dear Dr Leslie, just wanna say thank you for the super detailed recipe with all the scientific explanation! I have never baked a cake before and this is the first time I am baking a cake with my new oven. Looks like it is a great success! I followed almost all of your steps except I used a large pan for the water bath as I do not have a slightly larger tin and turns out okay! I will be trying your durian cheesecake recipe soon! Hope to get some fresh MSW while it’s still in season should be yummy! That is a mighty fine looking cake! Well done! Here’s my first attempt in making the cake. Its not smooth and it cracked a bit in the middle. I think these are the things that went wrong: 1. Inaccurate temp of the oven 2. Used 65g of egg (missed out on this one) 3. Overmixed the yellow team when i added the flour. What else? I would really want to perfect this cake. Thank you so much for a very detailed recipe. My oven doesn’t allow me to switch off fan mode. It turns on automatically once i switch on top and bottom heat. Should i still follow your baking time and oven temperature? You might have to lower the temperature by 20 degrees. Its trial and error as every oven is different. https://uploads.disquscdn.com/i https://uploads.disquscdn.com/images/293b220c394710063d36a377643c20e0a6ac7f520e132aa32b0b5885ee9923ff.jpg mages/9f4a7be39dfb593b4b8d2e59780348556fa35f31765f0f44bc8e8d8145de8653.jpg This is my 6th attempt I believe and I still have to figure out my oven 🙁 Almost every single time I bake it..with different temperature..I still got a crack on the top. So so sad. Any advice or encouragement that you can pass on to me?? 🙂 I can’t attach the pictures…don’t know why.. If it cracks that means the oven temp is too high. Low and slow is the way to go. Hi Dr Tay, thanks for the step by step guide (video), i manage to bake it on my 1st attempt! Its taste good but it taste & smell abit eggy rather than cheesy.. any advice on how to get rid of that eggy taste/smell? Thank u! Wow, that looks great! Not sure about the eggy smell. Maybe you can try another batch of eggs? How can i adjust the baking time and where to put the rack in oven ??? Hi, did you bought the light coloured non stick baking pan from this bakery shop? I couldn’t find the baking pan like yours. Yes, I did, but that was a long time ago! If I set the oven temperature to 200C but the oven thermometer that I place inside the oven shows 180C, should I increase the oven temperature so that the thermometer shows 200C before putting the cake batter to bake? After multiple attempts to bake Japanese cheesecake. I finally succeeded by following yours. I was so pleased with the result. Still over the moon right now because I was so frustrated with the previous..all either shrunk or cracked. Thank you for sharing your recipe, comprehensive how to, the video and tips. All the information was great in really understanding how to bake this cake. 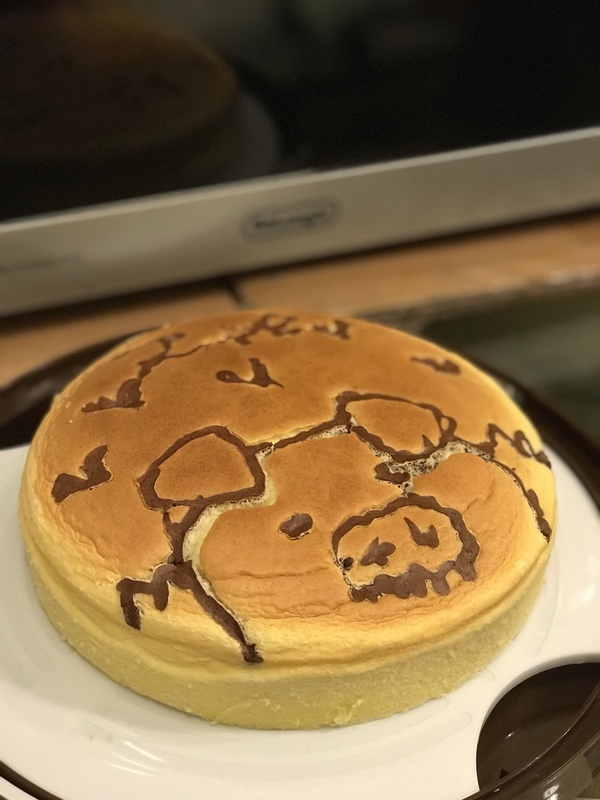 This was my first attempt at making a Japanese Cheesecake. Unfortunately mine was a fail but a very delicious 😋 fail and so I’m not that disappointed. It’s my oven. I moved house recently and am still trying to understand my oven. My cake didn’t get a beautiful tan and while in the cake pans looked ok. They didn’t crack but fell apart when I depanned them. Oh well, I will just have to try again. Well done! Thanks for your lovely photos! Your oven is not hot enough. Hi.. I had attempted many times and all turned out very good. However, I will get a denser layer, about 1cm, at the bottom of the cake. My cake raised to about 8cm and the remaining 7cm is perfect.. I hv no idea what went wrong.. I attached a picture of the cake for visual reference.. The exterior of the cake..
Hi dear Dr leslie, may i know after the baking, if we use a stick to test the cake, is it still wet? as mine is wet, and not sure is it cook, so i add more time to bake. The result still good. Yes you can use a stick to test. It should not be wet. Can u tell me temperature of baking please? 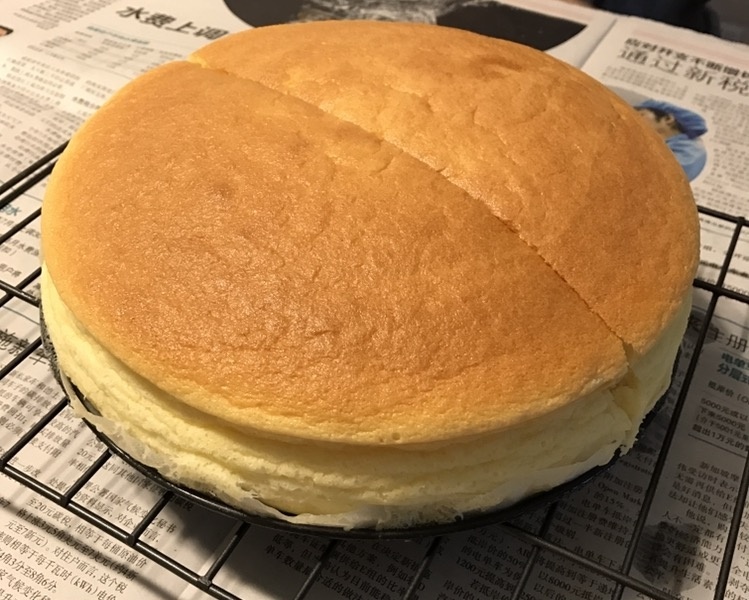 Thank you so much for the step by step instructions, my first attempt with a Japanese cheese cake, super excited that it turn out exactly like how it should be, taste great too, not too sweet. The only problem is the base didn’t exactly rise, could it be the water bath was too hot (I put boiling water) or was it because I didn’t put in the oven immediately? Would love to hear your feedback. Yes, the waterbath water should not be boiling or you will cook the cake too early. That means your oven isn’t hot enough. Hi, you seem very knowledgeable in troubleshooting his cake. I used a different recipe and it rose beautifully when baking. But after I turned the oven off for it to stand for 40mins as recipe stated, it went flat and was like a dense custard. I followed everything to the T. The flour I used was only 1/3 cup, was that too little? The oven was all condensed up from the water bath, did it put too much moisture into my cake? The flour is important as it adds structure to the cake! Why don’t you try using the measurements in the recipe and let me know if it works. I try today. The cake turn out ok on top. However the bottom have a one cm custard like form. Please help to identify what went wrong. Thanks. So glad to have found your blog, and this excellently scientifically detailed post on JCC. Thank you! However,it was after my 1st, and failed attempt at JCC that I found your post.I will obviously follow your recipe this time ,but if you could ease my apprehension,it would help. My JCC separated into 2 fully different textures : the top half fluffy,tasty and like ur pic, the bottom half dense,thick,eggy,and Inedible! Can you help explain why it happened,thus How to avoid it ? Looking forward to your response! Thank you so much. Hello Leslie. Thanks for your precise and detailed approach. I have two questions. You use 60 gr. eggs, but do you mean 60 gr. with or without shell? In your list of ingredients you mention 20 gr. cornflour, also in your point 3 about flour you mention cornflour, is that the same as cornstarch? In Holland cornflour (maismeel) usually means ground cornmeal. Thanks again. I buy eggs that are 600g for 10. Yes, cornstarch, not cornmeal. Hi, I tried this recipe twice and I met with differen challenged each time. For the 1st time, the cake was not cooked through and when i de-pan the cake, some parts will be stuck and the middle part is still quite wet. I did not line the pan with baking paper for the first time. For the 2nd time I lined the pan with baking paper but this time it seems the bottom of the cake sank and is not fluffy like the top part. Is this due to overmixing the batter? The cake did not seem to rise as much too. The problem is your oven temperature. It might not be hot enough. How much Pandan extract would you use if you wanted this variation? 2 teaspoons to 1 Tbsp should be good enough. I have never tried freezing it before! Hi Leslie, thank you for the informative post. Can you provide the weight for egg yolks and egg whites in the recipe? Where I live, large eggs weigh 56 g with a shell. Without a shell, they weigh approximately 50 g, about 20 g per yolk, and 30 g per white. Since every egg is different I always weigh my yolks and whites rather than count them, and I’ve found I get more consistent results. You mentioned 60 g eggs. While that is close to the 56 g eggs I buy, I’d like to follow your recipe as closely as possible, and a 24 g difference (4 g per egg, for all 6 eggs) plus the variations in shell weight may make a big difference. Hi. I tried to bake the cake with the same timing and temperature, however the cake was still wobbly in the middle so I put it to bake longer. I think my put more water in bake, so it will take longer time to bake. Trying to get the top brown so I let it bake longer, but the top looks a bit dry. Is it normal? Every oven is different, so you will need to experiment with it. Can I use low fat cream cheese? Hi Leslie, I was almost success in this cheese cake, but why do I experience the cake being uncooked in the middle? 🙁 is it because I didn’t bake it long enough? I used 60g corn starch instead of cake flour + corn starch. Baked for 1 h 20 mins in water bath at 150deg top bottom heat no fan. Leave in oven for 30 mins thereafter, and another 30 mins with oven door ajar. Perfect texture, no cracks. Try it. You can’t bake a cake without cake flour. What you have made is Kueh! The gluten in the cake flour is needed to help the tiny bubbles expand and keep the cake airy. Yes, the problem lies with the mixing of flour into the eggs. Make sure you stir it well so that it is well incorporated. This is not like pancake where you can leave lumps of flour in the batter. Better still, after mixing the flour into the egg yolks, sieve it to get a smooth batter and then mix that into the whites. Hi. First time making it. Every was good. Even while baking the top was some shaped and smooth. However, after switching off the oven and leaving it in the oven for 30 mins, a crack appeared. Should I open the oven slightly at the start of leaving the cake in the oven for 30 mins? Thanks. You will need to experiment as every oven is different. You need to do it while it is still warm and not wait till it has cooled down. Second time a success! You are right about flipping it over while the cake is still warm! Skin intact! Little crease from the paper when i flip it over but its ok! 😁 Thank you!!! Wonderful recipe & guidance! Just tried baking but not light and fluffy. Taste good though. Yes, it is because you didn’t mix the flour into the yellow team properly. After mixing the flour it needs to be of a certain viscosity, if it is too runny, the flour will sink to the bottom. Perfect first time around. Thank you Dr. Leslie. This is going on my favourite bakes list, together with your pandan chiffon cake. Good job! Thanks for letting me know! Hi, can you use a regulsr apricot jam glaze instead of the baking glaze to prevent the wrinkles? Thanks! Apricot jam may not be smooth. That is one mighty fine looking cake! Well done! Thanks for writing back to let me know! 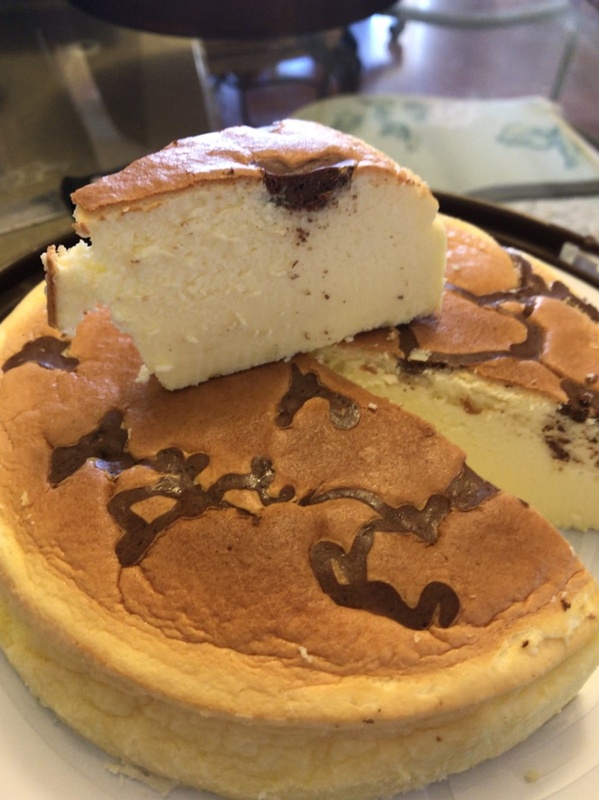 Home » Recipes » 2 ieat Recipes » Japanese Cheesecake Recipe: Almost everything you need to know!